National Arbor Day has been celebrated since the very first Arbor Day on April 10, 1872 in Nebraska. A pioneer named J. Sterling Morton, who had moved to the Nebraska territory in 1854, had the greatest influence in creating the holiday, and he worked hard to establish the importance of planting and maintaining trees throughout the country. For pioneers in the Midwest, planting trees was incredibly important for fuel, building materials, and even just having some shade amidst all the flat plains. On the first Arbor Day, it is believed that over one million trees were planted in Nebraska. Now, National Arbor Day is celebrated on the last Friday of April, but each state has its own special Arbor Day to plant trees at the most opportune time for their growth and health. If you are interested in the history of Arbor Day and the story of J. Sterling Morton, you can find out more here. If you want to get involved with Arbor Day in your own state or town, learn about planting and growing trees here. To see when your state celebrates Arbor Day, check out this map. Keep in mind that for many Southern states, state Arbor Day is celebrated earlier in the year! Arbor Day Square is a great book to teach your child the importance of helping the environment, and it also comes with the additional free resource of a teacher's guide. When the townspeople take up a collection to order trees from back east, Katie adds her own pennies and Papa's silver dollar. When the tiny saplings finally arrive, Katie helps dig holes and fetch water. Then in a quiet corner of the public square, Katie and Papa plant a flowering dogwood in memory of Mama. 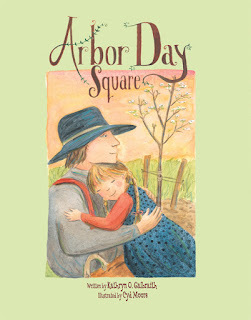 Look for Arbor Day Square at your local library, indie bookstore, or Barnes & Noble. Let us know how you chose to celebrate Arbor Day!